When you hear the name shiatsu, you image bakers kneading dough used to make bread. Of course, when looking for a great foot massager you want one that will knead your tired, sore feet. This is more so if your work involves walking around or standing for a long time. 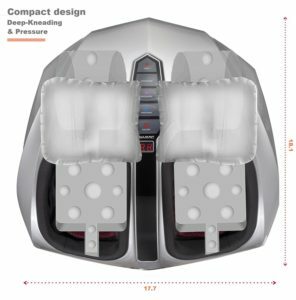 This Belmint Shiatsu Foot Massager review will tell you all you need to know about this foot massager. You will thus be able to make the right decision on buying one that is helpful to you. If you have been suffering from plantar fasciitis, then you know how bad heel pain can be. You also understand how much a foot massage can change pain to comfort in just a matter of minutes. This massager is also great for people who have diabetic neuropathy and arthritis. It is also great for people who have flat feet. Of course, if you do not have any of those conditions, it does not mean you do not have the right to pamper yourself with a great foot massage regularly/ this great device may be what you need especially if you crave a deep foot massage. The one thing you look for from any brand you buy items from is an experience. You will, therefore, be glad to know that this company has been in operation for more than a decade. It has learned what its customers are looking for. With all that experience, they know how to create products that work for their users. They have been in the industry long enough to have made mistakes and worked on them. Now, the products they produce are great and have great materials which ensure the device is durable. If you are looking for a foot massager that will save you a lot of money, this is it. This foot massager comes with deep kneading, vibration, and deep tissue massage settings. This means that you can do all this right from your home. You will, therefore, be able to save a significant amount of money. Thinking about it critically, if your masseuse has been doing the work since the day began, she/he may be too tired by the end of the day. You may therefore not get the type of massage your feet require to feel great. This machine, on the other hand, is unlikely to change the way it works. This Belmint Shiatsu Foot Massager also offers you heat function. What most people do not know is that heat during a massage is very helpful. Heat allows the machine to- increase blood circulation to your feet. Therefore if you have been straining your feet, you feel better. It is also great if you have an injury. The better the blood circulation to your feet white blood cells are transported to where you are injured. You will, therefore, feel better and more relieved of the pain you feel. As the machine kneads, it aims the right spots where the tensi0onof felt when you walk on your feet. It offers you a very satisfactory massage without compromising on quality and uniqueness. Heat is great for helping soothe your tired muscles and relaxing them. The switchable heat function works in such a way that the machine applies circular movements and deep kneads your feet at the same time. It aims and pressure point relieving any tension you might be feeling. You also have the freedom of choosing not to have heat when your feet are being massaged. You will no longer have to fee that your feet are crowded onto a small box during a massage. 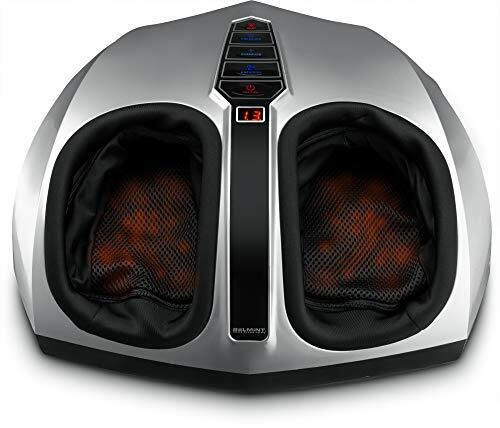 The Belmint Shiatsu Massager comes with a specialized chamber where each foot is able to fit. You, therefore, you feel that each of your foot is getting the right massage and care. This also promotes comfort and makes you feel better during and after the massage. One thing you will realize is that no two people like being massaged in the same manner. For instance, some people have sensitive feet and require lighter massage techniques while others love deep kneading. This machine offers you five massage setting to choose from. You can, therefore, adjust the heat and the intensity to one that suits you. This also makes the machine versatile enough to be used by most people. In addition to massaging the bottom part of your foot, it also massages the top and sides too. It also comes with a removable cover that allows you to maintain high levels of hygiene. This machine comes with a very light weight. This means you can have the massage done in practically any room in your house. In fact, if your boss will allow it, you can carry it to work without feeling that you have carried too much weight. The machine is very straight forward to use the buttons on it are well labels and easy to press. You will not have to worry about the intensity as everything is labeled. However, be careful with the pressure button because it moves from smooth to intense quickly and may startle you. This machine is perfect for people who suffer from plantar fasciitis, diabetic neuropathy, and arthritis. It is also great for people who want to relax after a long day at work. We love this machine because it offers deep kneading and deep tissue massage. It also allows you to choose whether to use heat function or not. This is a great machine for people who want functionality and effectiveness. If you enjoy deep tissue massages, this is the perfect machine for you. It is easily portable and convenient because you can use it from the comfort of your own home. Hope our Belmint Shiatsu Foot Massager review helps you to decide yours.